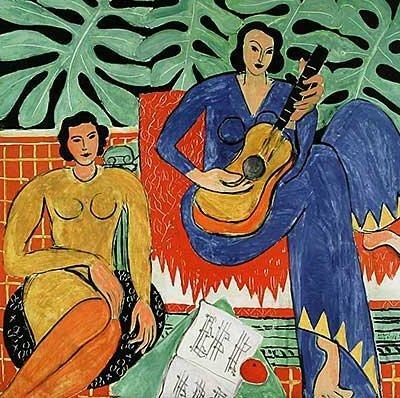 Henri Matisse orchestrates his very unique style within Die Musik. The picture plane is hugely broken up by two figures with exaggerated bodies. One figure seated on the left of the painting, the other seated on the right. The overstated bodies of the figures are draped across the furniture that also arranges the balance of the painting. Foliage in the background disrupts the picture with vibrant color set against a black background. A rectangular band of color runs across the painting just above the bottom. A triangle juts out of the bottom of the painting overlapping the band. Each element of the painting intersects another element of the painting. No figure is freestanding, everything is touching, and the image is crowded. Matisse’s appliance of paint varies. The figures such as, the two women and their clothing, the table, the rug, the guitar, the plants and the arm of the couch show light, thin strokes, almost streaky in areas. These strokes create texture giving the materials quality. The background consisting of the tile, the couch, the pillow and the black backdrop are filled with thick color. The strokes are thin but no longer streaky, the colors are full. The strokes in the backgrounds are strong. In the couch and the pillow Matisse adds thin strokes of paint to show texture within the material. Throughout the painting the paint is thin never thick. Matisse used only rich colors in his painting. Each color is solid with no obvious hints of other colors. The same sea foam green color is applied to the table, rug, couch arm and the plants. The thickest color in the plants. The tile in the background is somewhere between orange and red, the color of typical Spanish tiling. The mustard yellow of the woman’s shirt matches the yellow of the guitar and the light brown of the woman’s pants matches the bottom of the guitar. The black of the background and the pillow are startling against the brightness of the other colors. The black also forces the other colors to pop and become more vibrant. The other woman’s outfit is a royal blue color that takes up about half of the painting with the ballooning size of her pants. A light yellow, triangular pattern borders the cuffs of her pants. The couch barely shows its true color of white because it is covered with a red blanket. Matisse chose solely solid, full colors. The mood of the painting is portrayed through the shapes and the colors. The heads of the women are un-proportionally smaller than their bodies making their facial expressions seem not very important. Drawing from the posture of the women the mood is relaxed and at ease. The lines are not sharp and nothing is exact. The effortless strumming of the guitar and the all around calmness gives the painting a peaceful, easy feel.